Our Series 70 Manual Pinch Valve is the counterpart to the unique Series 75 and has the same design features and advantages, but the heavy cast iron housing is eliminated and a strong fabricated steel body is used in its place. The Series 70 is less costly, lighter, versatile, and can be used when the location of the valve is not exposed to attack from corrosives or other volatile material. The Series 70 is available in the same sizes and dimensions as the Series 75. Special face-to-face dimensions are available. The standard body material is fabricated carbon steel. Sleeve materials include Pure Gum Rubber, Neoprene, Buna-N, Butyl, Hypalon, EPDM, and Viton. 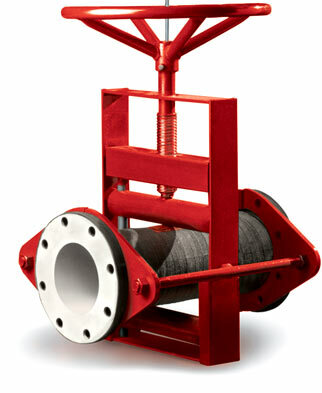 Operation of the Series 70 is the same as the Series 75, utilizing double pinch bars to compress the flexible rubber sleeve from above and below, closing simultaneously on centerline when the handwheel is turned.